Contrary to promises made in Geneva that in the name of peace and reconciliation the Sri Lanka government would dismantle High Security Zones, close army cantonments and return lands seized from the people, the Northern and the Eastern Provinces, considered the Tamil homeland, continue to be occupied zones even nine + years after the end of the war. Mullaitivu District:- SFHQ – MLT – 59, 64 & 68 Divisons. Tamil civilians live under a militarized and securitized system in which surveillance and intimidation continue in everyday life. The horrifying reality is that the military has no plans to leave but is there to stay, making the Tamils traditional and historical homeland a virtual military camp. The Tamils in the majority Sinhala military forces occupied areas in the North and East live in a Nazi style concentration camp. Military camps thrive well in the resettled areas, causing fear and trauma for many people are still living in a war related post trauma. They have natural fear about the hostile alien military. Despite numerous promises made to the United Nations and the International Community the Sri Lankan Government not reduced military presence in the North and East and it continues to occupy private property. The Government is unwilling or unable to overcome the political and administrative obstacles that stymie progress on the Reparation Office, Truth and Reconciliation Commission and Special Court to investigate war crimes, crimes against humanity etc. 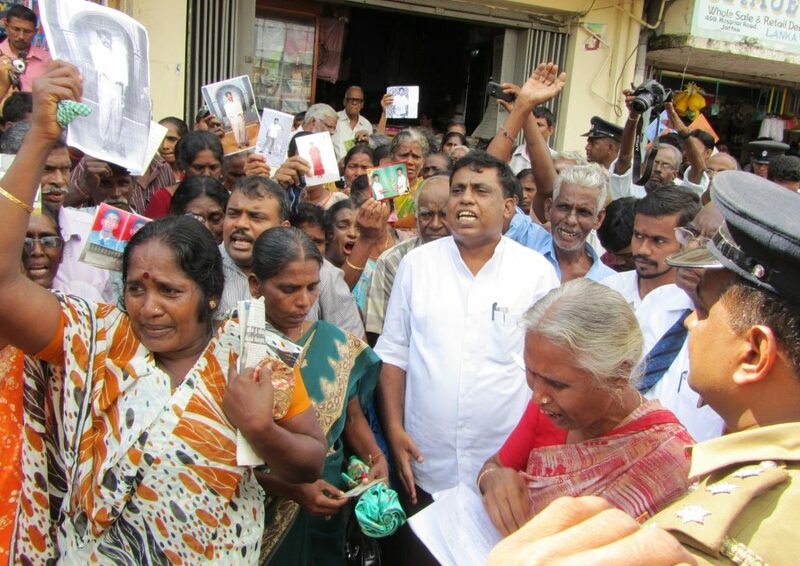 Protests by the affected Tamils whose lands are occupied by the military are continuing their daily protest for well over 500 days demanding answers. The continued military presence in Tamils homeland is viewed as hampering the post-conflict ethnic reconciliation. [The military is entirely Buddhist Sinhalese and the people in the Northern Province are Hindu/Christian Tamils. The North and East of Sri Lanka are not under the Sri Lankan Government but under the Sri Lankan [Sinhalese] military [99% Sinhalese]. It is a military state where the military can do what they want with no accountability. The Armed Forces have gone into non-military commercial activities. They are engaged in large scale property development, construction projects and business ventures such as travel agencies, holiday resorts, restaurants and innumerable cafes in the North and East. Tamils suffer from a lack of economic and educational opportunities and economic underdevelopment in Tamil majority areas. The Sri Lankan Government is good at talking, they will go on talking and the UN, HNHRC and the International community and Tamils would be fooled again and again as in the past. Sri Lankan Government is determined to protect the security forces even if they are war criminals. People for Equality and Relief [PEARL] have recently published a timely report based on field research that was conducted in January 2016. According to the report “Sri Lanka’s Military is still heavily involved in civilian affairs. Unsurprisingly sustained militarization continues have extensive negative effects on the Tamil community, this includes ongoing reports of sexual violence and fewer livelihood options for Tamils, among other problems. Waiting to return home is the continued plight of internally displaced people [IDPS] on post-war Sri Lanka. If the Government was serious about addressing Tamil oppression, it would have ended the military occupation of the Tamil areas and repealed the Prevention of Terrorism Act. Instead, Government is seeking to get the 30/1 Resolution amended to wriggle out of inclusion of foreign judges failing which it will seek an extension of two years to do nothing in the hope the problem will disappear. It is to be noted that the President of Sri Lanka has vowed several times to protect the Security Forces even if they committed war crimes, crimes against humanity.President very recently at a meeting in Nivitigala, has again vowed to vindicate Security Forces at the United Nations General Assembly where he is scheduled to speak on September 24, 2018 [Daily News of Sept. 09, 2018], and even requesting UN to drop and abandon the allegations of war crimes etc. and grant a blanket general amnesty for the Security Forces so as to ensure their guaranteed culture and policy of impunity. Member of Parliament Hon. S.B. Dissanayake, a Cabinet member of the previous Rajapaksa administration said that “the media, too, were aware of some of those executed after they had surrendered (with White Flag after UN negotiated the surrender) though they remained silent. “Both you and we don’t talk about those who had been executed,” the National List MP said. THE LEGACY OF WAR CONTINUES TO IMPOSE HARDHSIPS, PARTICULARLY ON CONFLICT AFFECTED WOMEN.